Tiger Woods wins the Masters. If ever five words did not do justice to an outcome ??? Let debate now rage as to where this sits in the pantheon of sporting comebacks. Fourteen years after he last put on the Green Jacket, 11 years after last winning a major and 24 months after conceding to friends ???I?? ?m done??? Woods completed a triumph which rates as extraordinary even by his standards. Tiger Woods: five-times Masters champion. The scene was barely believable. That Woods won his 15th major from the position of behind after 54 holes ??? something he had not achieved before ??? hardly registered amid the chaos. It would require the pagination of a telephone directory to properly record what occurred on this Masters Sunday. Woods?? ?s closing round of 70 for a 13-under-par 275 ensured he won by one from Dustin Johnson, Xander Schauffele and Brooks Koepka; not that anybody seemed particularly bothered about raw details. Superlatives rained from the skies. Francesco Molinari, who showed such fortitude for three and a half days, wobbled horribly over Augusta?? ?s famous closing stretch. The sorest episode of all for the holder of the Claret Jug arrived at the 15th, where he found the middle of a pond when only 79 yards from the hole. Molinari?? ?s share of fifth does not at all illustrate his contribution to this major. At 9.20am all 445 yards of the 1st hole ??? with spectators 10 deep in places ??? gave the impression half the state of Georgia was watching the final group. Woods, by his own admission prone to terrible bouts of nervousness before opening tee shots, split the fairway. As Molinari tugged his approach shot long and left, gallery excitement grew; the Open champion was to save par from 13ft. A straightforward Woods birdie at the 3rd reduced Molinari?? ?s advantage to one. As the wind whipped, Woods under-clubbed his tee shot to the par-three next and paid the penalty by way of a bogey. There was likewise for Woods at the 5th, a hole he played in an aggregate of plus four. Suddenly Molinari was three clear. The sense this would be Molinari?? ?s day escalated as Woods failed to convert from 11ft for a birdie at the 6th. Molinari, having overshot the green, scrambled quite brilliantly for par. Unbowed, Woods fired an approach to the 7th to tap-in range as Molinari dropped a shot, his first in 50 holes. Woods produced a contender for shot of the Masters at the 9th, with a lagged downhill putt from 70ft. There was no such salvation on 10 where Woods paid for a pushed tee shot by way of another bogey. Molinari?? ?s advantage was two from Woods and Koepka, with the latter seriously wounded by finding Rae?? ?s Creek from the 12th tee. Koepka?? ?s mental error proved a sign of things to come. How that 12th hole, at just 147 yards, torments the finest players in the world in the final round. Ian Poulter had already followed Koepka into the water by the time Molinari and Woods were roared on to the 12th tee as if gladiators. Perhaps Molinari?? ?s mind slipped towards what grisly outcomes Amen Corner?? ?s reputation is built on; a miscued iron shot bounced from the bank and into the most famous stream in golf. It was the least surprising Sunday act that Woods took dead aim for the centre of the green. The Masters 2019: Tiger Woods wins 15th major and first in 11 years ??? live! Molinari?? ?s double-bogey dropped him back to a share of the lead at 11 under. He did not just have Woods for company at this stage; up ahead on the 13th green Xander Schauffele?? ?s birdie meant a three-way tie. Rain battered down to add to the sense of theatre. Patrick Cantlay produced an eagle at the 15th to skip to the top of the leaderboard at 12 under. The final group had holes ??? including two par-fives ??? on their side but worsening weather could offset the advantage. Schauffele joined Cantlay with a birdie at the 14th. Molinari?? ?s approach to the 13th clung on for dear life, thereby ??? temporarily ??? saving him a second visit to Rae?? ?s Creek. Cantlay?? ?s dropped shot at 16 and Schauffele?? ?s failure to take advantage of the defenceless 15th looked significant. Cantlay stumbled again at the penultimate hole. Not so Johnson. Birdies at the 16th and 17th edged him to a share of the lead ??? Koepka immediately joined the same party ??? as Woods launched a drive to within 234 yards of the par-five 15th green. Molinari?? ?s capitulation, painful to view, was the next sensational strand. Having caught far too much turf with his third shot to the 15th Molinari was lucky his fifth did not find water as well. It did not particularly matter; a double-bogey was a decisive blow to his Masters hopes. The 16th, where Woods has previous, saw the winner hit his tee shot to three feet. The lead was two. Tiger, young or old, does not fritter that away. 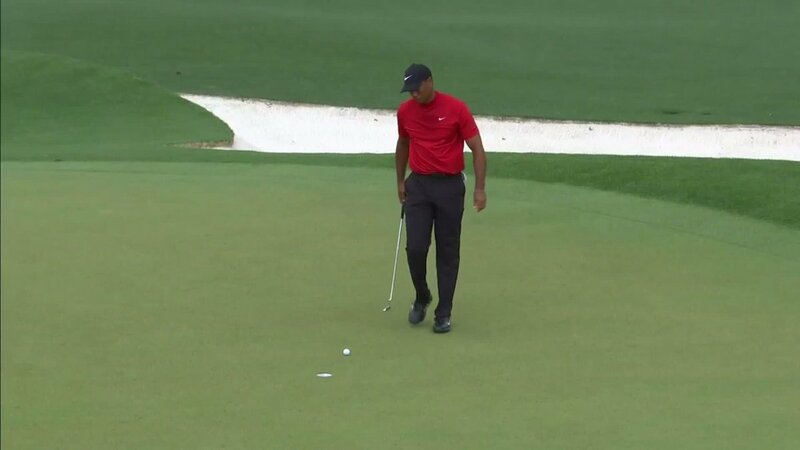 Woods had two putts for victory at that 18th; in adding to the drama, he used them. As the leaders jousted so, too, did the remaining non-professionals. Viktor Hovland took the honours for the low amateur. ?? ?I felt really calm out there,??? the 21-year-old Norwegian said. He could have sold that emotion for a good few dollars to players of higher status. Rory McIlroy, a self-confessed ?? ?Tiger geek??? posted a 68 for a share of 21st before finding a berth from which to witness the denouement. ???It?? ?s anyone???s,??? said McIlroy at that stage. It was Tiger?? ?s ??? Lazarus has competition.